... of JS Bach's wildly popular "Italian Concerto"! There are at least two dozen performances of the piece available on CDs, often coupled with Bach's "Chromatic Fantasy and Fugue BWV 903", following the precedent set by Wanda Landowska. It's easy to hear why the Italian Concerto is so popular. It's what musicians call a 'barn burner' - a waker upper - brimming with energy. It demands the utmost of the harpsichord in percussive excitement as well as structural urgency. And then the Chromatic Fantasy/Fugue arrives just in time to carry the listener into a realm of intellectual absolution from mundane emotionalism. This recording adds another stage to the progression from exuberance to serenity by including the "French Overture BWV 831", a study of reserved worldly elegance, and four brief keyboard 'duets' BWV 802-805, with their clear cold running-water counterpoint to calm the listener's spirit before the Chromatic Fantasy floods his/her mind. I recently reviewed Cristophe Rousset's recording of Bach's "Goldberg Variations" in less than enthusiastic terms. Nobody is always sublime, and I found that performance marred by odd acoustics. This re-release of a 1992 recording has no such flaws. The sound recording is excellent; what you'll hear sounds like a real harpsichord in a real concert space. In fact, the harpsichord is the real McCoy, an instrument built by Henri Hemsch in Paris in 1751. Harpsichords are hugely less 'uniform' in timbre and touch than modern pianos. This harpsichord has a gorgeous depth of timbre without any loss of transparency. It's a perfect choice for playing Bach. The player, of course, makes some difference also. 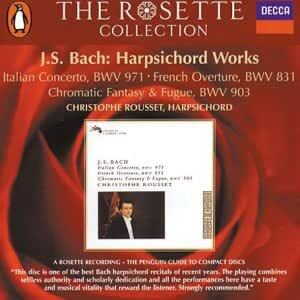 Christophe Rousset not only plays Bach almost flawlessly but also interprets Bach intelligently. His phrasing of the opening theme of the Italian Concerto, with its dramatic hesitation, will quicken your attention even if you've heard the piece clattered by other harpsichordists, rumbled by pianists a thousand times. Then, on the duets and the Fantasy, you'll hear why only the harpsichord is suitable for enunciating the cascades of flashy, sparkly little notes. Rousset's fingers fly. He's a two-handed keyboardist, both dextrous and sinistrous, making the two 'voices' of the duets equally and independently eloquent.